Medusa’s touch turns human hearts into stone. as far away as eternity. The following is a poem I wrote in the late '90s. It's a nostalgic poem in which I recall the city of Florence in which I had just spent 2 years studying literature and literary criticism. At first I felt alone and a stranger, but eventually I made some good friends and considered Florence as my second home. Uno sguardo indietro literally means "A look back". Time flies and places change. However, frequently one has flashbacks and memories of times and places past. Sometimes one can also remember particular sounds or scents attached to certain places. Florence is a city 100 times worth seeing. I would suggest first to read a lot about this city (a Renaissance jewel) and eventually visit it. 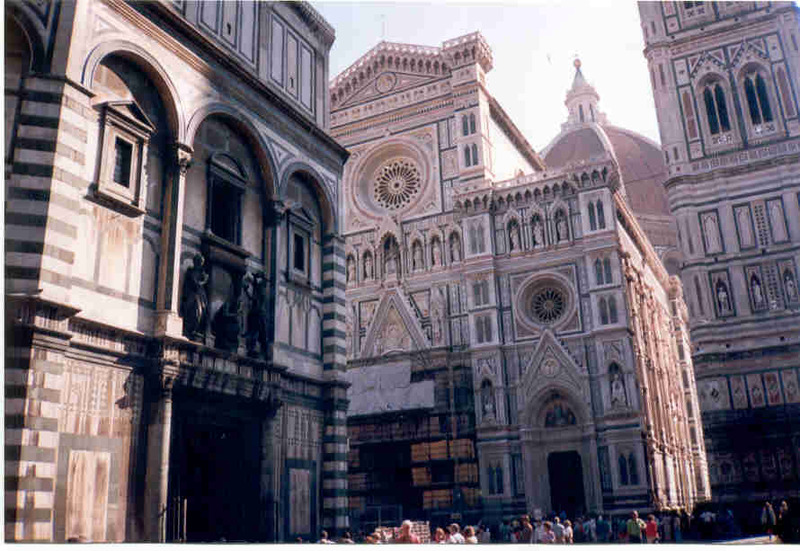 The photo shows the Santa Maria del Fiore Cathedral and the Battistero in front, both in the heart of Florence. si sciolgono i mesi, le stagioni. si scoglie nel nulla. . .
rievocazioni di questa città signorile. che cangiano in cento colori. il suono di mille vetture. che ti sbarrano il cammino. . .
madre di mille pittori, scrittori, scultori. . .
Firenze, mecca di mille persone curiose. . .
gli echi di mille ricordi. e ritorno indietro nel tempo. The 11th September 2001 event was lived by millions through television and internet. It was a tragedy which influenced many in different ways. Many wrote their thoughts after such a cathaclisma, others wrote short poems to express whatever passed their minds at that terrible moment. The poem "My photo" was written after one of my frequent talks with my now 80 year old aunt. She likes to read my articles whenever they appear on local newspapers and magazines. Once she told me to give the paper one of my photos so that they could publish it together with my writings. My immediate reaction to this is expressed in the poem. and they'll include your photo. Why shouldn't they know who you are? she said. on my tomb, lest I deserve it. it'll grow yellow and fade. sucking our brains like leeches. My name is Patrick Sammut. I'm from the island of Malta. Born in 1968. I am a high school teacher at De La Salle College, Malta. 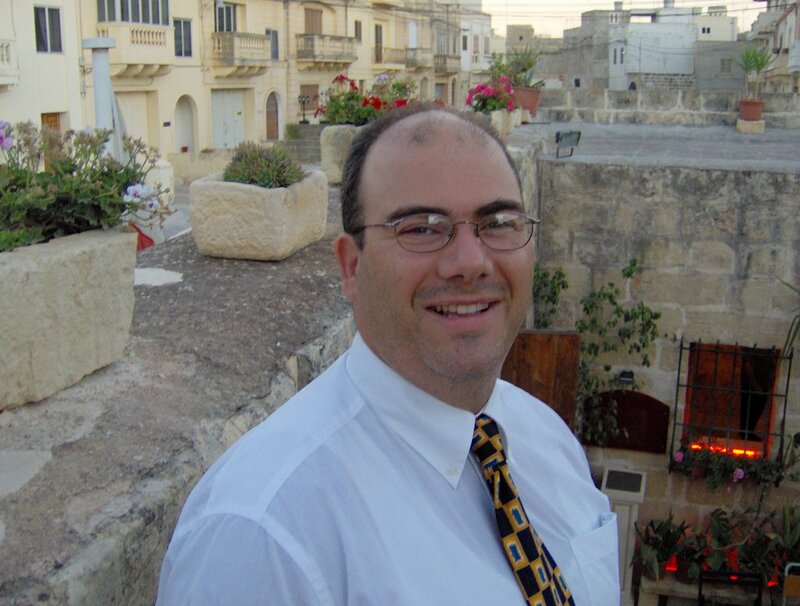 I've been teaching Maltese and Italian language and literature since 1992. Between 1994 and 1996 I was studying Italian literature and literary criticism at the Universita' degli Studi of Florence. I have a Masters Degree in Contemporary Italian Literature and a Post Graduate Certificate in Education in Italian (both from the University of Malta). I am married to Rosalie and father of Andrew and Kristina. My main interests are reading, especially world literature, philosophy, history, cinema, art and the like. In my free time I often write short articles or studies in Maltese about local literary publications and writers, Maltese society, but also about world literature and culture in general. I also write verse in Maltese, English and Italian, but not on a regular basis. I am also an active member of local literary associations, in particular Ghaqda Poeti Maltin (Maltese Poets Association) of which I am vice-President. As part of the GhPM Committee I write various contributions for the association's magazine VERSI (I am now Editor of this poetry magazine), including poems, crit articles and poetry book reviews. I am also editor of the GhPM quarterly newsletter and of the Literary Evenings Pamphlet, a project I initiated last November 2005. As a poetry association we organise poetry evenings for the general public and for members, publish the Versi mag which is the only poetry mag on the island and where you can find poems written in various languages such as Maltese, English, Italian, French, German and Esperanto. I also coordinate the literary page of a weekly local newspaper in Maltese, IL-GENS ILLUM. Through this blog I'd like to share my articles, studies, poems, thoughts, but also my many notes on various literary texts used at High school in both the Maltese and Italian academic programmes. Hope visitors would find such a blog interesting and useful.